Time races on and waits for no one. Often, we can get lost in the game of catching up with life in the fast lane. But there are moments in life that slows us down and invite us to look at the bigger picture. These are intense moments that are full of breathe of grace. They enable us to distance ourselves from the ongoing drama of life and take an overview that gives us a glance of length, breath and height of life. Such a bird’s view is excessive and refuses to be broken down to its constituting elements. We cannot swallow it in a single bite. We have to take its intensity sip by sip. These rich moments invoke a sense of gratitude in us. It springs forth joy and enkindles a feeling of contentment and we are grateful to God and people who have been part of this eventful journey. Come April 10th 2019, we have an instance of such an experience where time thickens for us and we are moved to melt into a song of praise of God for giving us a good shepherd after the heart of his son in the person of Archbishop Filipe Neri Ferrao. As he marks the silver Jubilee of his Episcopal ordination, it’s time to stay with our intense feelings of gratitude, which nurture our faith and manifests that our Lord Jesus Christ is alive in the pastoral leadership of our Archbishop. Born on 20th January 1953, ordained priest on 28th October 1979 and was ordained to Bishop on 10th April 1994. This makes it 25 graceful years of life in the sandals of the Apostles of our Lord. He served the Church in Goa and in India with great distinction, dedication and love. From these, we can single out the eventful, illuminating and heart stirring ten year from 1994 to 2004 when he served the Church as Auxiliary Bishop of Goa Diocese and visionary, compassionate and synergizing fifteen years at helm of the pastoral leadership as the Archbishop of Goa and Daman from March 2004 onwards. He also shouldered positions of profound leadership in the Western Region and in the National Church under the CCBI. Today he heads the Church in India as the president of the CCBI. In all these various offices he has served our Lord and his Church with admirable dedication and compassion for the people of God. His leadership has beautifully drawn out the youthful exuberance of the Church and attacked young and the old to serve God and Humanity with tremendous love and courage. Among several blessings, I count my contact with Archbishop Filipe Neri very early in life as a unique manifestation of providence. First in my Parish in Chinchinim as a child where he was Assistant to the Parish , then as prefect in the minor seminary, regency at Lar de Estudantes, Panjim under his guidance and then finally being ordained deacon by him, I think my experience of life has placed me uniquely to know him closely. I see him as a leader who lets the Church become a living sacrament of divine providence, a visible sign of invisible grace of God’s providence. Among all his qualities, I always admired his qualities of heart. He has a marvelous personality that attacks persons of all ages. His powerful capacity to remember names and a sense of profound appreciation makes him a magnetic person. Besides, I find that his love for God and his people has dawn him to the final prayer of our Lord Jesus which prays ‘that they may all be one’ (Jh 17:21) and he has translated it creatively into a mission of communion in the Church through by giving primacy to the small Christian Communities and the Parish Pastoral Councils in all the Parishes in our diocese. His exceptional gifts of his head could be seen in his excellent academic performance as a student but is manifested in his preaching, teaching ministry and conflict resolutions in our diocese. 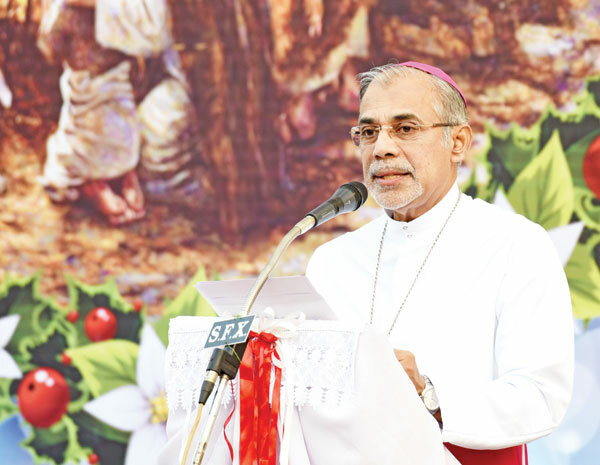 The manner in which he led the Post-synodal Church with courage of convictions in its ups and down Goa after our Archbishop Emeritus Raul Gonsalves exemplifies the presence of our Lord and power of Holy Spirit in the Church. Archbishop Filipe has always been people’s bishops. This may have been difficult to stomach for some among us. He exhibits that he has his ears to the ground and mind open to Holy Spirit as he leads the people of God in Goa. I am always at awe to see his matchless ability to listen with the heart to our people. This listening heart has always been his great strength. Paradoxically strengths can also become slippery for some among us view this very strength of listening differently. Like any fruit bearing tree has to bear the stone palters, our archbishop has his detractors. They seem to point out that it can render him vulnerable to that fact of being be dictated terms by a few. Others among us do critique some of his decisions. We can never please all. Life is complex and everyone sees our works from different viewing positions. As humans, there is always room for us to improve. We know that grace works on nature. This is the reason why in the divine and human Church of our Lord, we have the faith and hope that grace will always be victorious in the Lord. If we take time and see the mega picture, we will be enabled to see the hand of God in the pilgrimage of the Church in Goa. It is the grace laden leadership our beloved Archbishop that gave us twenty five illustrious years. I see the spiritual centre in Old Goa and the Good Samaritan fund for the poor as unique manifestations of God’s providence under him. He has taken the Church once again on the streets to serve the poor and become a sacrament of God’s providence to the poor in our parishes. May God continue to bless the Church in Goa through the visionary and dynamic leadership our Archbishop Felipe Neri Ferrao.